FORKS, WA—It took Roberta Wood a 2,000 mile plane ride, two ferries, two transit bus rides and a long drive around Lake Crescent to visit Carl Lausche in the West End of Clallam County, WA. Lausche, 86, lives in a comfortable new mobile home in a clearing behind his daughter Linda’s house surrounded by miles of deep evergreen forest, mountains, and glacial rivers that teem with salmon and steelhead. The region is famed for receiving 114 inches, 12 feet of rain annually. 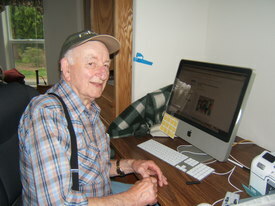 A long time PWW subscriber, Lausche welcomed Wood, this writer, and his wife Joyce to his home. He is almost totally deaf so Linda served as interpreter in our conversation. His home is decorated with cards from President Obama thanking him for his generous support in the 2008 presidential election. He told us he is very happy that Obama won but expressed deep concern about the continuing war in Iraq and Afghanistan and the worsening economic recession. Lausche and his late wife, Mary, were both born and raised in Minnesota. Carl had served as a medic in the U.S. military in France. While bivouacked in the countryside one frigid winter, he developed pneumonia. It developed into an ear infection that severely damaged his hearing. In 1949, the young couple settled in Clallam County. He found a job as a shingle mill worker toiling there for 17 years. They had strong progressive convictions and Mary and Carl were involved in labor and peace struggles. They became friends with Supreme Court Justice William O. Douglas, an outdoorsman with an abiding love of the natural beauty of Clallam County. In 1958, Douglas led a protest hike from Rialto Beach to Lake Ozette to block construction of a highway through the magnificent forest and along the Pacific ocean beaches of what is now a vast, forested, pristine section to the Olympic National Park. With strong backing of the Lausche’s and millions of other nature lovers, that battle was won. Even today, Carl Lausche is an enthusiastic sport fisherman angling for salmon and steelhead in the nearby Bogachiel River. Sitting on the desk behind Carl was a shiny new desktop computer, a lifeline that enables him to communicate without the need to hear. “I use it for sending emails, following the news,” he said. He opened up his computer. We showed him the wide range of stories posted every day on the PWW web site. Carl nodded. “I can do that,” he said. “I have enough in my checking account.” He pulled out his checkbook and wrote out a check for $1,000. “You are the first!” Wood exclaimed. “We hope to find another 99 who will give as generously as you!” Carl Lausche’s face lit up with joy.